More information: North Atlantic Oscillation’s fourth album, two years in the making, melds intimate textures with cinematic arrangements to create yet another unclassifiable sonic experience. Originally self-released on CD, the album has already been described by The Scottish Sun as “An experimental masterpiece”, by The Progressive Aspect as “Sublime... If ‘The Third Day’ was velvet, this is felt” and by The Skinny as a “sonically rich and vibrant universe”. Known for their unique combination of sonic complexity and melodic intrigue, North Atlantic Oscillation have released four albums of delicately intelligent music, and frontman Sam Healy has recorded a warmer, intimate take on the band’s sound as part of his solo project SAND. 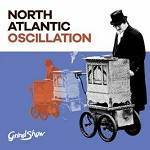 Championed time and again by industry gatekeepers, such as Zane Lowe, Guy Garvey, Marc Riley, BBC 6Music, BBC Scotland, BBC Introducing, Prog Magazine, Drowned In Sound, NME and many more, North Atlantic Oscillation have gained a dedicated fan base ever since their debut in 2010. The band have also had successful UK tours as headliners and as support for Porcupine Tree, Anathema, Engineers, Blackfield and Bob Mould.